AD SPECS - An abbreviation of advertising specialties. These consist of promotional items, including pens, key chains, magnetic business cards, baseball caps, etc. They are mainly sold to small business customers. A telemarketer will often print the customer's business name, address and telephone number, or special message such as an anti-drug slogan, on the promotional ad spec item. ADVANCE FEE FRAUD - The object is generally to trick prospective victims into parting with funds by persuading them that they will receive a substantial benefit in return for providing some modest payment in advance. 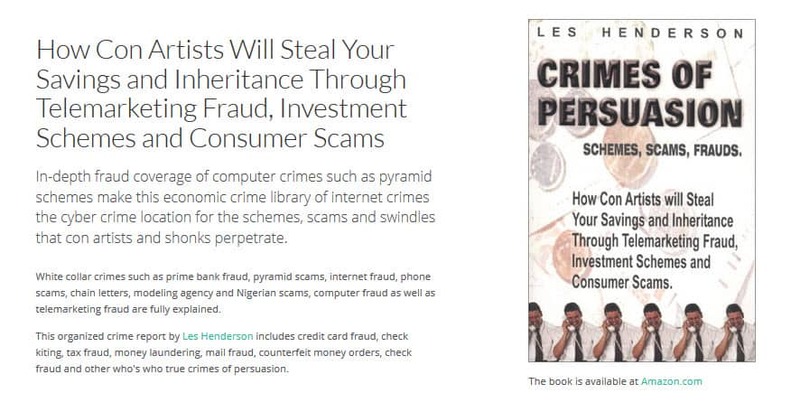 The characteristics of this type of fraudulent scheme often entail enlisting the services of the prospective victim to assist in an activity of questionable legality, thus providing some assurance that the victim would be unlikely to report the matter to the police, once defrauded. The victim would, rightly, be apprehensive that he or she had aided and abetted some criminal activity and would also be reluctant to make public the fact of his or her gullibility, particularly if adverse media coverage was a possibility. Thus, the offender is able to carry out the scheme repeatedly, sometimes in respect of the same victim, leaving the police faced with difficulties in finding witnesses and securing evidence. BINARY COMPENSATION PROGRAM - A promotional term used to describe a pyramid scheme. BOILER ROOM - A term commonly used to describe an office setting involving high-pressure sales tactics, the use of multiple phone lines, and a sparcely appointed office (making fast, fly-by-night moves to a new location easy and efficient). The origin of the term refers to a time when telemarketers would acquire cheap office space, often in the basements of buildings, which was typically hot, uncomfortable, and noisy. BUSINESS OPPORTUNITY FRANCHISE SCAMS - Attempts to sell businesses or franchises to entrepreneurs. Income figures are usually grossly exaggerated. CATALOG REBUTTAL - A term referring to a sales technique that many telemarketers use. Telemarketers will instruct customers to mail in a photograph of themselves, sometimes with their award or bonus. Customers are told that this photograph will appear in a future promotional catalog that the company will publish. This rebuttal tends to lend legitimacy to the promotion even though the catalog is never actually published. CHARGEBACKS - A customer's cancellation of a credit card charge that he or she had made for an original purchase. The customer subsequently receives a refund on his/her VISA or MasterCard and the telemarketer's merchant account is charged with an offsetting chargeback for the amount of the sale. CHARITY ROOM - Telefunding where a very small portion of the funds raised, usually less than 10%, if any, goes to legitimate charities. CHECK DEBIT (SIGHT DRAFT)- A method of payment in which the telemarketer is able to receive funds directly from the customer's checking account via electronic transfer. This eliminates the actual drafting of a check as well as the float period for the instrument to clear. CLOSER - A telemarketing sales representative (rep) who specializes in finalizing or closing the sale to a customer. Closers are usually experienced telemarketers who take over the sale from the "fronter" and generally command a higher commission per sale. CLOSING RATE - The actual percentage of customers who purchase the product out of all those who are contacted. Typical closing rates fall between 3 and 10 percent, depending on the experience of the sales reps and the sales tactics used. COLD CALLING - Unsolicited outgoing telephone calls to potential customers. Potential customers' names and telephone numbers are usually purchased by boiler room owners in the form of "lead lists" (also called "mooch lists" or "sucker lists" by criminal telemarketers). CONTROL NUMBER - Also called a claim number or activator number, this is the number listed on a mailer or promotional card sent out to a prospective customer. Sales reps use this number to verify that the customer has been pre-selected to receive an award or bonus. Most telemarketers represent that this is a unique customer number which has been registered in their computer system, when, in fact, the number acts merely as a state or mail batch identifier. CUSTOMER SERVICE - A separate division in most telemarketing companies whose sole responsibility is to handle customer complaints. DEMAND DRAFTS - Telemarketing frauds are often based on the creation of "demand drafts," rather than checks. A demand draft resembles a personal check but carries no signature. In place of a signature, it has a notice that the account holder has given permission to have money withdrawn from his or her checking account to pay bills for goods and services. DROPPING MAIL - The process of mailing large volumes of promotional materials (award notification letters or cards), usually several times per week, to entice potential customers to call in to the boiler room. This practice is used as part of an "inbound" telemarketing system. EMPLOYMENT SCHEME - A scheme that preys on persons' desperation for work. They advertise that they can arrange to obtain jobs for prospective clients for an up-front fee. FRONTER - Generally, an inexperienced sales rep who handles the first portion of a customer sale. The fronter will obtain basic customer background information and provide the customer with an outline of the promotion before turning the telephone over to a closer to finalize the deal. GIMMIE GIFT - The award or bonus that all customers receive. Even though sales reps advise customers that they may receive one of several valuable prizes, if they receive any prize at all, each customer actually receives the same gimmie gift, usually a prize of very low value. Typical gifts include a travel certificate or a piece of cheap jewelry. HARD GIFT - An extra or throw-in gift given in addition to the gimmie gift in order to entice the customer to make a purchase. Like the gimmie gift, it usually has a very low cost, although it is represented to be quite valuable. Typical hard gifts include a diamond pendant or designer watch. INBOUND SYSTEM - Boiler rooms which receive incoming customer calls through the use of mailers, newspaper advertising, or automatic dialing systems. LAYDOWN - An easy sale. A customer who is so excited about the promotion that he or she becomes an easy target for the sales rep.
LEAD COSTS - The costs associated with obtaining and contacting new customers. These costs include lead lists, telephone bills, advertising expenses, postage, and the costs associated with distributing a mailer. LEAD LIST - A list of potential customers which a telemarketer purchases from a lead specialist. Also called "mooch list" or "sucker list." This list of names and telephone numbers represents potential customers who are most likely to be interested in the promotion based on past buying tendencies, income bracket, etc. Lead lists are often sold at a cost of between $3 and $5 per name. LOTTERY SCHEMES - A type of telemarketing scheme. Victims are told they are entered into a foolproof method to win state or foreign lotteries. Sales of foreign lotteries are inherently illegal. The scheme generally purchases few, if any, lottery tickets, and overhead costs and commission costs take a large proportion of the funds. MAILER - The actual letter, card, or award notification that the telemarketer mails to potential customers in order to entice them to call in for more information. Most fraudulent telemarketers that use an inbound system use such mailers. MERCHANT ACCOUNT - A VISA and/or MasterCard operating account that telemarketers establish at legitimate financial institutions so that customers can charge purchases on their own credit cards. A merchant account is actually a clearing account which the telemarketer maintains at a bank. Customer charges are credited to the account and funds are subsequently transferred to a separate corporate bank account, usually the next day. In general, telemarketers have an extremely difficult time obtaining merchant accounts due to the high volume of charge-backs and the nature of the industry. MISREPRESENTATIONS (MISREPS) - Untrue or deceptive statements that sales reps make to entice a potential customer to buy or send money. Misreps may include false statements concerning award, bonus, or product values, product or award quality, facts concerning the telemarketing company, odds of winning a specific award, profit potential of an investment, organizations on whose behalf monies are being solicited, etc. MOOCH - A term that telemarketers use to describe a victim, particularly a naive customer who is easily influenced and manipulated by the sales rep when closing the sale. MYSTERY PITCH - A presentation in which a salesperson solicits money by convincing victims that they have been selected to receive a valuable prize but are prohibited "by law" from disclosing the prize. In fact, no federal or state law prohibits truthful disclosures of prizes or awards. OMISSIONS - Significant facts relating to a telemarketing promotion which the sales rep withholds from the customer. Omissions may include hidden costs or restrictions relating to the promotion of which the customer is unaware. ONE IN FOUR (FIVE OR SIX) - A common telemarketing scheme, in which potential customers are notified that they are guaranteed to receive one of the listed awards currently being given away. The listed awards, which often are listed in order of ascending or descending value, typically include items of substantial value, such as an automobile or cashier's checks. Every one in four, however, includes at least one "gimmie gift," such as "limited-edition artwork" or "his-and-hers diamond watches," that appears expensive but has a value far less than the amount of money that the telemarketer seeks to obtain from the victim. Variations on this theme include a "two in six" or allowing the customer to delete one of the prizes from those listed. In these latter schemes, telemarketers carefully include multiple "gimmie gifts," so that even after the victim eliminates two gifts the telemarketer can still give the victim a "gimmie gift" rather than a truly valuable prize. OUTBOUND SYSTEM - Unsolicited customer contacts generated exclusively through cold calling. Telemarketers purchase lead lists and sales reps call these leads without invitation. Opposite of an inbound system and generally a more difficult sale. PRE-QUALIFICATION - Qualifying customers in advance of the lead or sale, in other words, verifying that the potential customer can afford the promotion and has ready access to funds before spending a considerable amount of time trying to make the sale. PRIZE ROOM - A company whose pitch is to convince victims that they have won a valuable prize but first must send a fee or purchase some product to qualify for the prize. PRODUCT ROOM - A company whose pitch offers to sell a product such as jewelry or travel, or provide a service such as time share resales. The product is inevitably never delivered, has substantial added costs, or is worth far less than stated in the telemarketing pitch. PROMOTION - The total package being offered to the customer which usually includes a product, bonus, or award and any other incentives used to help close the sale. This package is usually referred to as a promotion, a limited offering, contest, or lottery being provided to "select" consumers. REBUTTAL - Standard responses that sales reps use to overcome typical customer objections. Rebuttals are often pre-printed and readily available to the sales rep in order to help overcome customer hesitancy to purchase. RECOVERY ROOM - Boiler room or rip-and-tear operation which tells victims they can obtain refunds from companies which previously defrauded victims. Recovery rooms charge an up-front fee, and frequently make false representations that they are affiliated with a law enforcement agency, a court, or a law firm. RELOAD (LOAD) - An attempt to resell a customer who has already purchased from a telemarketing company. Customers who have made a purchase in a previous promotion are often re-contacted and promised the chance of winning more valuable awards in exchange for a subsequent purchase. Customers can be reloaded five, six or more times, each time being promised grander awards with greater chances of winning. RELOAD (LOAD) LIST - A lead list of customers who have previously made purchases in one or more telemarketing promotions. Telemarketers may keep these leads for themselves or sell them to other boiler rooms. RIP AND TEAR - Where the telemarketer makes calls from a motel room, apartment or phone booth and induces a victim to send money, generally through a wire service or to a mail drop, by promising the victim that he or she will receive a large cash prize. They collect as much money as possible in a short period of time, before leaving town or changing locations. Frequently, rip-and-tear operators use aliases and rent mail boxes, known as mail drops, to help them avoid detection. SALES PITCH - The presentation (typically written) that sales reps use to help convey the nature of the promotion. This "pitch" lists all the key selling points which management deems necessary to complete the sale. With experience, sales reps tend to develop their own unique pitch or selling style which works best for them. SEED PITCH - The pitch that an automatic dialing system uses when generating leads. The seed pitch is replayed continuously over the telephone in an attempt to solicit potential customers. SIGHT DRAFT (CHECK DEBIT) - A method of payment that enables the telemarketer to receive funds directly from the customer's checking account via electronic transfer. This eliminates the actual drafting of a check as well as the float period for the instrument to clear. TAKEOVER (TO) - Similar to a closer. One sales rep may take over for another in order to try to close the sale. A sales rep may ask for a TO in order to put a fresh voice on the phone who can try a different tactic to sell the customer. VERIFICATION - "Confirmation" of a customer order. Either during the telemarketer's sales call or shortly thereafter, an employee of the telemarketing operation will contact the customer and review the information that the sales rep provided. While the verifier purports merely to verify the details of the transaction, he or she may also introduce new false or misleading statements into the conversation to further the sale, or may ask leading questions (such as "The salesman didn't promise you anything, did he?") with the object of tape-recording the victim's answers. This allows the scheme, in the event that the victim or a friend or relative later contacts the operation to complain about the transaction, to play the tape back to the victim. VERIFICATION RATE - The percentage of customers who continue with the purchase upon "verification." Depending on the product, promotion, and the experience of the verifier, telemarketing verification rates may vary between 60 and 95 percent. VICTIM VENUE - Cases in which prosecution takes place where the victim resides rather than where the fraudulent telemarketer is doing business.